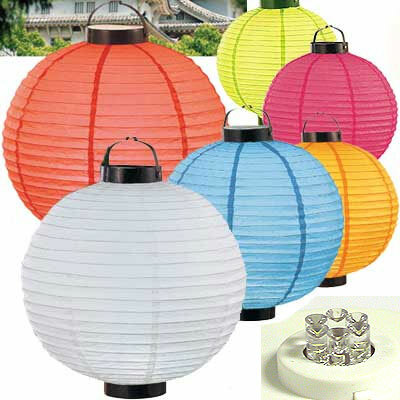 The brightest LED battery operated paper lanterns on the web. Each terminal base includes six LED(WWH) Bright-Burst tpye bulbs that illuminate Tru-color. Rated life of 10,000 hours. Takes three AAA alkaline batteries(not included) for 22 hours of light. Use as table centerpieces or hang them on tents and trees. Keeps your party nicely lit all night without changing batteries.